Codebun provides free and easy education to every student who wants to learn. Main focus to provide easy and valuable content for Computer Science student. We will not charge anything for students or other learners. We are providing easy tutorials for computer programming languages and problem-solving algorithms for real-time practice. Free notes for students as well as video tutorials with examples for practice which will be easy to understand. Codebun Provides free support to Cumputer science students. Codebun is dedicated to all programmers who really want to learn. We try to solve every problem in an easy way. Here you will get lots of useful content related to programming and new updates every day. Information related to Computer Application which will help you lot to keep updated as a techie guy. programming problems solving with practical examples and source code. Android tutorial with real-time problem-solving examples. Complete Java web project with source code. Java interview questions and answers on every topic. Java tutorial with the practical example. If you have any question and you got stuck so don’t worry codebun is here to help you. Learn like a beginner and perform like a Pro. Codebun is open to all types of advertisements especially banners. These are the primary options for advertisements as of now. If you are interested in other types or a different system of advertisements, kindly contact me using the form given below. Pricing is based on monthly periods. 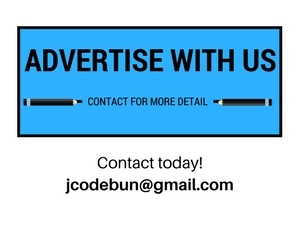 As for now, all the pricing will be negotiated using e-mail if you’re interested in advertising on codebun. Please drop a mail to jocdebun@gmail.com for any queries.